Electrical Company - Current Technologies Ltd. Looking for an Electrical Company? If you are looking for the services of an electrical copany, then you have found the right place! Here at Current Technologies Ltd. we offer a wide variety of electrical services for our clients. From lighting repairs, to fire alarm installation, and everything in between. Trust Current Technologies with all of your electrical contracting needs. 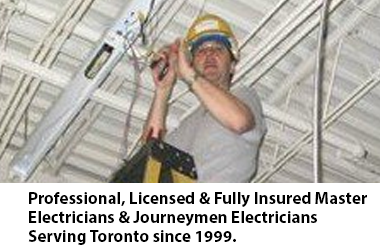 If you are looking for a specific electrical service, give us a call today and speak with a member of our team at 416-240-7691. Current Technologies offers services such as Installation Services, Life Safety System Installation, Lighting Upgrades, and many more electrical services which we offer to our many customers. If your requirements are becoming desperate, call Current Technologies Ltd today at 416-240-7691 and ask for a no obligation estimate.